The Saint: Relevant to Skyfall? 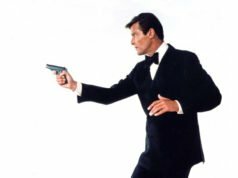 As Roger Moore celebrates his 85th birthday today, we look at some very relevant tailoring from his past. 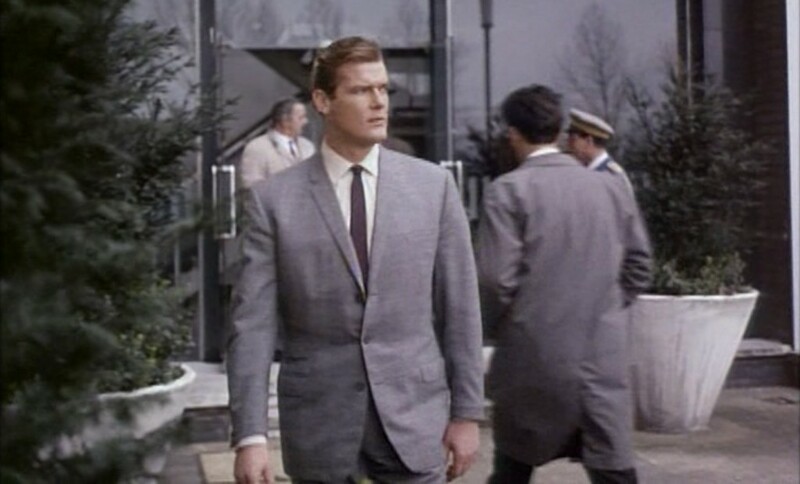 A blue-grey, subtle Glen Urquhart check suit first featured in the fifth series episode of The Saint “The Helpful Pirate” has quite a few similarities to the suits Daniel Craig wears in Skyfall. The similarities are the obvious ones: three buttons down the front, very narrow lapels, a shorter jacket length (though Moore’s isn’t as short as Craig’s), a single vent and flat front trousers—Moore’s are actually darted, but it’s the same idea—with a tapered leg. This suit is unique in The Saint in that it’s the only one that stylistically bridges the more traditional suits from the first four series to the more rakish suits in the fifth and sixth series. The overall cut is where 1966 and 2012 differ. Cyril Castle’s suit jacket for Moore has natural shoulders whilst Tom Ford’s suit jacket for Craig has slightly built-up shoulders. Moore’s jacket has a full, draped chest whilst Craig’s has a cleaner, close-fitting chest, but both have a lot of waist suppression. Moore’s trousers have a higher rise than Craig’s, and the legs are narrow but not skin-tight. Moore’s jacket has the added details of single-button gauntlet cuffs and a ticket pocket. Moore wears the suit with an ecru shirt with a spread collar and double cuffs. 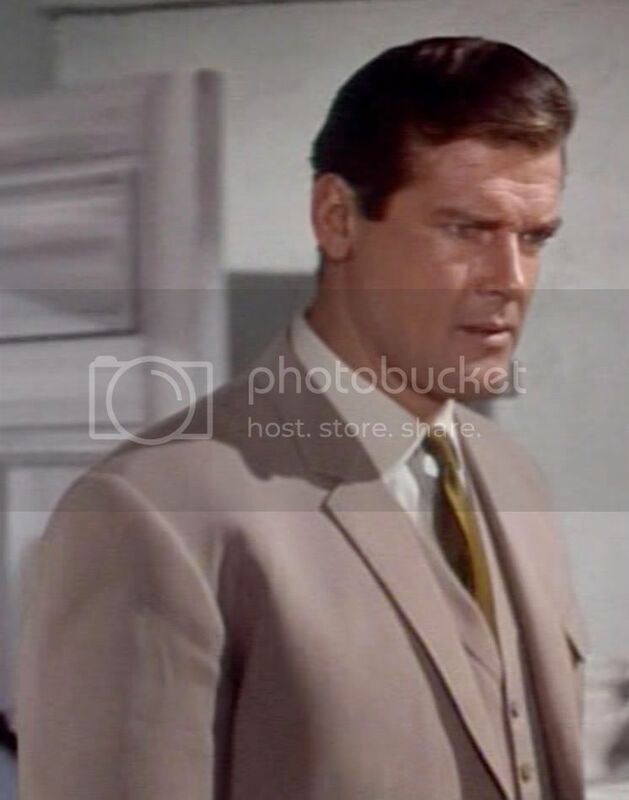 A grenadine tie knotted four-in-hand makes a connection to the Bond films, though Moore’s is an aubergine purple, a colour Sean Connery never wore. Moore wears black slip-on shoes and ecru socks, unusually I suppose to match the shirt. In another connection to Bond, Vladek Sheybal, who played SPECTRE agent Kronsteen in From Russia with Love, is featured in this episode. Overall the Cyril Castle suit worn by Moore looks a lot better than the Tom Ford “Falconer” worn by Craig. I say this when the lapels are rather narrow for my taste and both suits look weird with their low and closely spaced three button front. 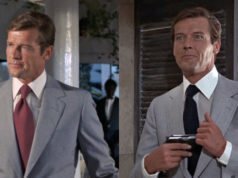 In any case, Roger Moore has proven time and again that bespoke suits will always look and fit better than off the rack, even with concessions to tailoring trends of the time. Beautiful suit, with a lots of Edwardian details (I believe it was the time of hte”neo-edwardian” reaction in the 60s in England). 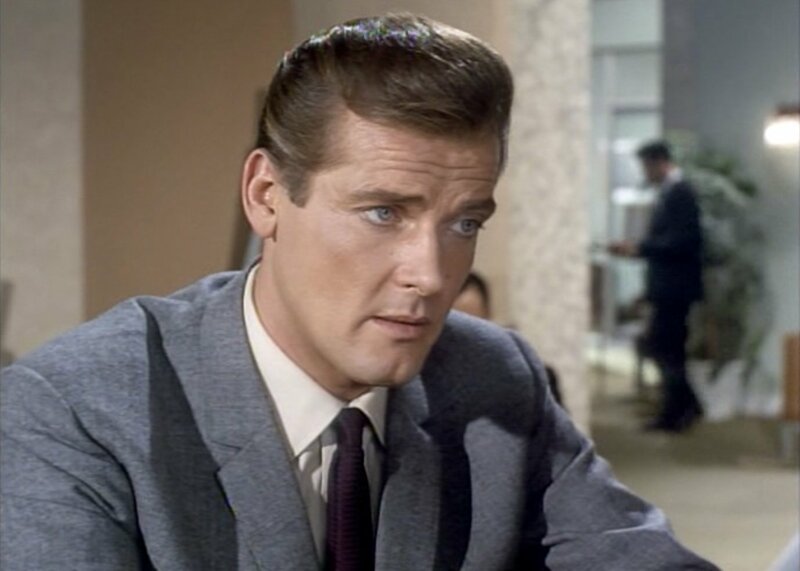 Here Moore reminds me of French actor Jean Marais, who also wore similarly cut suits at that time. But the lapels are far too slim for me. I presume they are even slimmer as Conney’s suits lapels. I suppose such a slim lapel only emphazises Moore’s strong physique and chest -am I right about that Matt ?-, but it still looks rather strange to me. Such slim lapels on such a strong person creates a big contrast. The narrow lapels do make Moore’s chest look bigger, though the drape also does that. Originally the drape cut was done with very wide lapels, so that’s what makes this suit look strange. I can see the stylistic parallels between this suit and Craig’s suits in Skyfall and, frankly, I think both looks are equally problematic, albeit in different ways. While Moore’s suit does conform to the traditional rules of good tailoring, the combination of the drape chest and tiny lapels creates a very bizarre look and ruins the proportions of Moore’s physique. He looks comically barrel chested and, given the length of his legs and the narrowness of his trousers, the end result is far from flattering. It instead gives him the silhouette of a puffed up bullfrog. 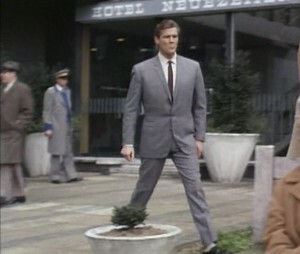 Moore’s Douglas Hayward suits are a better match for his body type. 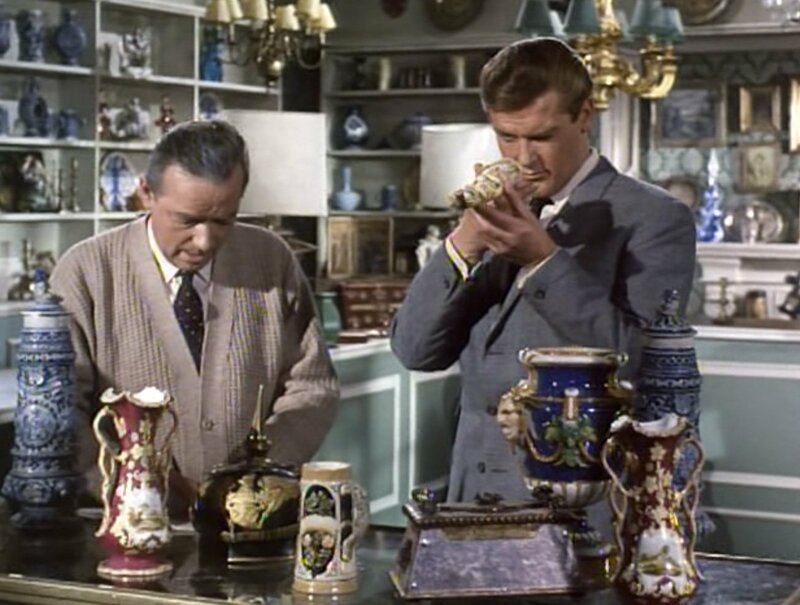 It’s funny you should say that : Jean Marais actually played “The saint” in the french adapatation of the series. The film was released in 1966. Ah bon ! Comme quoi… Merci, je ne savais pas. I think the suit coat looks fine, as seen in the top picture. I don’t think it’s the most evil thing to make Moore look as though he’s been lifting weights. However the full semi draped chest in combo with narrow flat front trousers looks just plain wrong. The effect is like looking at a box on sticks. Agreed with the box on sticks comments. However, I have to disagree regarding the suitability of the jacket by itself. It doesn’t make it Moore look like he had been lifting weights. Moore isn’t that muscular, he just has a large, full ribcage. The result is that by enhancing the size of his chest through a full chest and narrow lapels while having relatively narrow sleeves, is that it makes his chest look disproportionate to his arms. That is part of what I find awkward about the suit’s cut. The silhouette of the suit resembles Bender the robot from Futurama. I’ll grant you that, it does give Moore a robotic look. Matt, speaking of the suits in Skyfall, Craig was photographed wearing what appears to be one of his personal Tom Ford suits at a recent Skyfall press event. It appears to be the same O’Connor model worn in the film, except the 2 button variant that Ford is promoting/selling as the suit used in the film. I know you have mentioned in the past that Ford seems to design his suits to fit more traditionally than how they appear in Skyfall and have speculated that it was probably the costume design who chose to fit the suits so tightly. Is it just me or does Craig’s suit at the press event seem to be the fit preferred by Ford? There does not appear to be the characteristic pulling of the suit around the fastening button that the Skyfall suits are guilty of. That suit isn’t much different from the ones in Skyfall; it’s still too short but it’s fitted well everywhere else. I suspect it’s the same size as the Skyfall suits, but Daniel Craig has just lost some of the muscle so it fits better. Maybe it’s my age (27), but I find myself really liking the suit Craig is wearing there. As you say it may be due to him shrinking a bit, but the suit looks very clean and structured. At least that’s how it appears to my untrained eye! I’m not keen on looking like you’re about to bust out of it but this looks good. But then….I’ve seen a different view, and it not covering his derriere is not all that flattering. Exactly. It’s an inch short of covering his bottom. Actually, the deep charcoal suit in that link above is the same button three as the Skyfall suits. In contrast to Ford’s suits this outfit is well tailored but it is not at all the best example of Castle’s tailoring and Moore’s sartorial taste. There are far nicer suits from the “Saint” series (although I know you chose it on account of some superficial similarities to Craig’s current crop). He wore some attractive three pieces in this colour series and the following, final “Saint” series, and these could make for interesting future posts. I don’t care for the excessively slim lapels in the same way as excessively wide lapels are equally jarring and disproportionate. I also, try as I might, cannot make out the Glen Urquhart check in the material of this suit. Even from the pictures you have posted of it. This cloth is very similar to the Glen Urquhart check suit in Goldfinger. A close-up high resolution picture is needed to really see the pattern. The outline of the pattern can be seen in some shots from behind, and bits and pieces of the pattern can be made out in some of the close-up shots. I agree that there are nicer suits in The Saint, particularly that light brown suit.